description for "Winter Squash and Pumpkins: Cucurbita pepo, 'Sweet Dumpling'"
Cucurbita pepo 'Sweet Dumpling' may be the sweetest squash ever. The prolific compact vine yields up to 10 fruits which are teacup-shaped, ivory colored with green stripes. 'Sweet Dumpling' needs no curing to store for 3-4 months. Sow 2-3 seeds every 2-3 feet in rows 3-6 feet apart when danger of frost has passed. Thin to one plant. Can be sown indoors, 2-4 weeks before the last frost, and transplanted very carefully. Enrich soil heavily with mature compost. Harvesting tips. Pick before frost when stem cracks and skin hardens. Cure in sun for 10 days, or indoors at 85ï¿½F for four days. Planting depth: .5-1 inch. Days to germination: 3-7 days. 100 days to maturity. 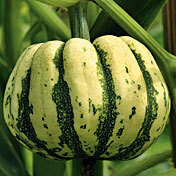 reviews for "Winter Squash and Pumpkins: Cucurbita pepo, 'Sweet Dumpling'"